A few weeks ago I saw this posted: 40 Tiny Tasks For A Richer Reading Life. Knowing that I won't be able to pry my husband away from the NCAA basketball tournament this weekend, I plan to hang out with him and do a lot of reading. I love many of the suggestions on this list, like #5, asking others for recommendations. Once while traveling, I went into a tiny indie bookstore and asked the clerk to recommend three books she'd recently enjoyed. That helped me discover new authors! I miss reading aloud to my kids (#11). I can't interrupt my husband's basketball, and I fear reading to my cat would make me more eccentric than I'd like to be--at this point in my life, anyway. I always enjoy reading novels about places where I'm planning to travel, so I like the suggestion of reading a book about a place I've never considered going (#23). Pretty sure I'll end up wanting to go there, too! The book abuse doesn't appeal to me. Dog ear a page? (#15) No way! Crack a spine? (#35) Ouch! I'm also notorious for reading a book because the movie is coming out soon, and loving the book so much that I no longer want to see the movie. The trailer for The Lady In Gold made me grab my copy off the shelf and read it right away. Wow, I loved the book--an intricate, spanning decades of time, well-researched nonfiction story. The movie can never delve into it all… But maybe I'll take on task #37 and see the movie without wanting it to be exactly like the book. How are you going to challenge your reading? I loved losing myself in Deborah Lytton's new YA novel, SILENCE. Readers of all ages will love this sweet, tender romance! Here's my interview with Deborah. Leave a comment to win a copy of the book! What's your best advice for fellow writers? My best advice to fellow writers is to share the best advice I ever received: Write. We spend so much time at the computer being distracted by other things, it’s important to free our imaginations from the clutter and just create. So even if you only have time for a few sentences, make sure you write every day. I am a single mother of a 10 and 13 year old, and I work part-time as a lawyer as well, so there are some days I don’t make it to the computer. That’s when a pad of paper and a pen are my best friends. Sometimes I even write in the car while I am picking up one of my girls from school or a music class. The key is to write. What popular writing advice do you never follow? Outlining. For me, outlining is confining. I prefer to let the story take its own course and lose myself in the process rather than work from a specific layout. This method takes longer than writing a story with an organized outline, but it helps me create without limitations. That’s not to say that I don’t have the beginning, middle and end plotted out. I do have an idea of where the story is going, I just don’t like to map out the journey. I write in notebooks at the beginning, using pen and paper. I try to choose ones that are not too fancy because I have found that if they are really nice, I don’t want to scribble in them. But I always go with covers that inspire me with color or design. I try to carry the current WIP notebook with me at all times. Then I move to my laptop. My favorite spot is at a writing desk that belonged to my grandmother. It has a lot of special memories attached to it, and I always feel like my grandparents are encouraging me when I sit there to write. I also have a constant writing companion—my dog, Faith. She sits right next to my chair while I work. I think she likes to listen to me type. What's the best book you've read on the craft of writing? There is one book I keep next to my desk, The Writer’s Journey, Mythic Structure for Writers by Christopher Vogler. It’s based on the work of Joseph Campbell, and it has always inspired me. Another book that I keep nearby is Natalie Goldberg’s Writing Down the Bones. It’s a gem. What are you reading for fun these days? I am in the midst of finishing a new manuscript, so I haven’t been reading much myself. But I am reading books with my daughters. My 10 year old is reading Rules by Cynthia Lord. So she reads chapters aloud to me. The book is really touching and so well written. My 13 year old and I are reading Princess of the Silver Woods by Jessica Day George. We read chapters together and then hand the book back and forth so we are always at the same place at the same time. The book is really engaging with an inspiring, brave heroine which I love. I wanted to thank you, Sydney, for hosting me on your blog today. This has been so much fun! One accident. Two lost souls. And a promise. 17 days together. To hear without hearing. And speak without speaking. 17 days to fall in love. Told in alternating points of view from both Stella and Hayden’s voices, Silence is a lyrical story of self-discovery, romance, and resiliency, of two souls finding their voices and breaking through the silence. Deborah Lytton is a writer and actress who began her career in front of the camera at the age of six. She graduated from UCLA and Pepperdine University with a degree in law. Deborah lives in California with her two daughters. She is active in the writing and blogging community and is a member of SCBWI. Leave a comment to win a copy of SILENCE. Open to anyone worldwide! If you want to be creative… be a 5th grader! Tuesday night I conducted short writing workshops at Davis Reads Family Literacy Night. More students than ever attended the event (super exciting to get stuck in traffic for a literary event)! Many students shared interesting ideas, characteristics, and unique responses to the situations, but the true out-of-the-box thinking came from 5th graders. Ten and eleven-year-olds possess solid skills, but they haven't reached that point of self-consciousness that hits with puberty. That gives them such creative freedom! And, oh, they love to share and share and share. The craziest idea of the night involved a hippo! The story worked! Older teens don't share much. The ones who show up for family literacy nights really, really want to write. They listen attentively, write furiously, but they don't dare allow anyone to judge their work publicly, especially a room full of strangers. Teens stay after to privately ask important and deep questions. I've noticed that the teens who do share in public often stick close to the established YA cannon when creating their work. A sameness often seeps into the work of students once they hit the age of twelve. Many years ago I judged the PTA Reflections contest at a neighborhood elementary school. Wow! The fifth graders wrote amazing stories and poems--clever, personal, fresh. The 6th graders, on the other hand, wrote almost as one mind. Safe subjects, safe interpretations. I've observed this same split while teaching in the classroom. I have to push 6th graders to dare to be different, not to worry about what others will think. That brings me to my own creative life. How many times do I secretly fret about what others will think about my writing? Do I dare write about ? What will people say? Will my neighbors stop talking to me if it gets published? What will people say to my husband at work? What if people think that I'm like my characters? I, too, could use a good dose of my inner 5th grader! Teen Me would've loved social media--for stalking boys. I can only imagine the hours I would've wasted reading posts and profiles and texting my friends back and forth to decode various nuances. But what would I have done about the obligatory selfies? And my only Snapchat friends are my daughters. 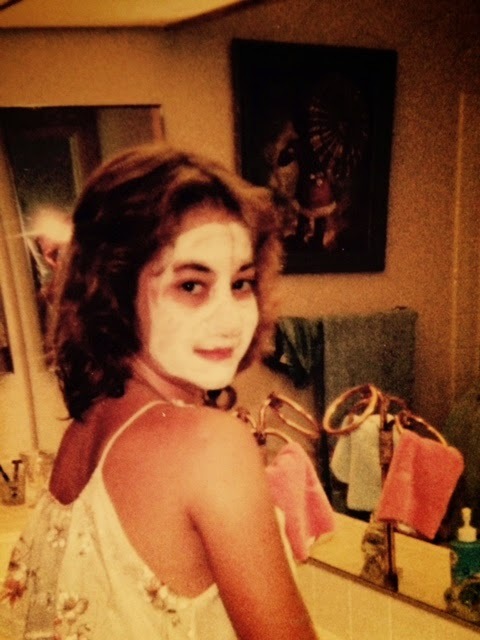 My 9th grader spends a lot of time talking about the way girls alter their appearance online using various apps that brighten eyes, clean up complexions, shrink, enhance or blur facial features… Other girls simply hide all but their eyes. That would've been me! In November a plethora of "leaf selfies" appeared on my daughter's Instagram account. During a hike, we took our own leaf selfie as a joke. I admitted that Teen Me would've been all over the leaf selfie, and any other means to hide my nose. A few weeks ago, my step-sister scanned and emailed a photo of fifteen-year-old me. Even coming of age pre-technology hasn't protected me from Throwback Thursdays! My first thought: Aw! I like this photo. My next thought: Because you can't see your face! And the next thought: Really, Syd, you're still thinking like this? After all these years? I've worked so hard--and continue to work as aging alters me yet again--to overcome my body image issues, and accept myself JUST AS I AM. But I'm no longer hoping to find a boyfriend, hoping to fit in at school, hoping to be somewhat popular, or at least not be stuck on The Outside, hoping that I'm okay--whatever that actually means, but it somehow has to do with beauty… right?!? I have so much empathy for all those teens trying to create photos that make them feel like they fit within society's too-narrow standard of beauty. Almost everything else in life matters so much more, but how can you explain that to teens living their most insecure years in front of an ever-present camera? Teen Me wouldn't have believed it, either.